Nik Wallenda takes a pause from walking, reaches into his back pocket for his mobile, snaps a selfie, tucks the phone away and calmly presses on. If he were anywhere other than on a three-quarter-inch tightrope, nearly 100ft off the ground and holding a 47lb (21kg) balance pole, it would be an unremarkable act. However, it elicits gasps from the crowd below. Wallenda’s daredevil walk follows in the footsteps of Philippe Petit, the Frenchman who walked the World Trade Center towers in New York in 1974. 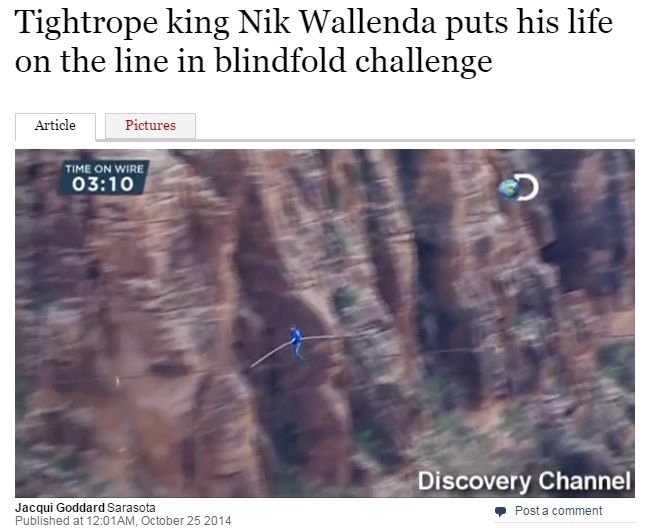 It also comes two years after Wallenda crossed Niagara Falls on a tightrope and a year after he traversed a Grand Canyon gorge. The latest walk will be undetaken in two stages. The first will take him from the 587ft pinnacle of the Marina City west tower on one side of the Chicago River to the 635ft Leo Burnett building on the other, on a steel wire at a 15-degree rising incline. For stage two, from the east Marina City tower back to the west, he will be blindfolded. It will be screened live on November 2 by the Discovery Channel. He will have no safety tether, and there will not be a net to catch him if he falls — just as there wasn’t when his great-grandfather, Karl Wallenda, 73, plunged to his death on live television while walking a wobbling tightrope between two ten-storey buildings in Puerto Rico in 1978. “I don’t doubt that he looks down and smiles on me,” says Wallenda, 35, a father of three from a family of performers whose high-wire accomplishments stretch back seven generations. He has trained in gusts of up to 120mph and never fallen off the wire. He gets family members to try to push him off while blindfolded, to practise correcting his balance. “They push me harder and harder and I’ll stay on the wire, never come off. Never,” he says. Posted on October 29, 2014 by richluscombe. Bookmark the permalink.